I was in the ancient town of Dwarasamudra, looking for the remains of this dynasty . There were ruins, of old temples, Jain bastis and even the remnants of an old fort and a palace. The Pushpagiri hill looked down upon us hidden by a cluster of small village homes. A gentle breeze took us down a small lane covered by a canopy of trees. As we walked down, we stumbled upon an ancient kalyani or step well. A bunch of kids played on the steps and looked at us with a tinge of curiosity. The village was called Hulikere. “ Huli means tiger and kere refers to a pond,” explains the watchman there.” This is Queen Shantala Devi ‘s private pond,” he adds with a tinge of flourish. “You know, the security was so steep that even a tiger could not walk in to see her- that’s why its called Hulikere.” I took in the irony of security guards protecting the queen and her maids from tigers while bathing and pottered around. Small shrines adorned the steps of the well, while the fluffy clouds reflected in the waters . Frogs hopped around with the fish swimming blissfully in this heritage pond. The Hoysalas are remembered today for their temples around Malenadu . Historical records say 1521 temples across 958 centres were built while today 434 temples survive across 238 centres . Most of the temples here are either in ruins or are in an obscure village waiting to be discovered. 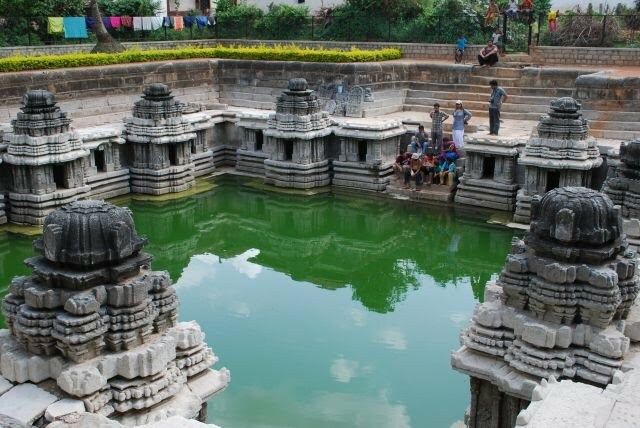 An ASI document refers to a Bhuvanabhurana Catteshwara temple built at Hulikere by Cattaya, a subordinate of King Narasimha , one of the Hoysala rulers. Another document narrates this story . When he was going to Belur from Halebeedu , his carriage driver , Bittideva noticed a desolate temple and asked the king to give grants and renovate it.The king gave away dry and wet lands, a tank, oil mills for supply of oil to burn lamps and established a Saivite settlement with two rows of houses . Bittideva also received grants and built the Maideshwara temple and Bittideshwara temple in the vicinity. The area is today identified around Hulikere and Pushpagiri at the periphery of the Dwarasamudra. A shrill cry of parakeets interrupted our reverie. 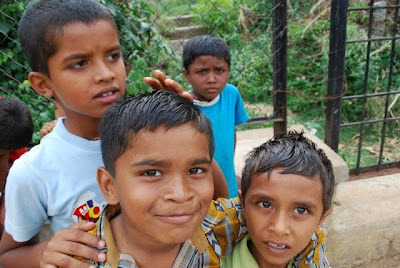 The children had got over their shyness and were all willing to pose for pictures in return for chocolates . We shut our book and watched the colours of the sky change . 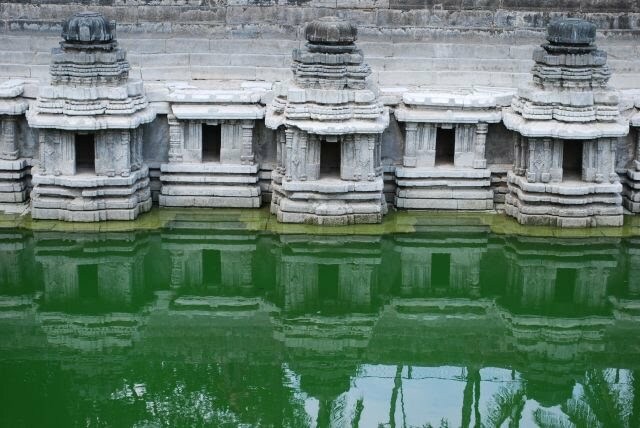 The sun may have set on the Hoysala dynasty a 1000 years ago, but they made sure they left their mark behind. What a beautiful pond!. Thanks for taking us to Hulikere. One day I’ll see this one also; great wonder!! Beautiful! For a moment I felt like I was there with you, and these images are just as stunning. Learned a lot about Hulikere. It’s beautiful despite of its oldness, its not look like 1000yrs old. I am just wondering, how can people in that place preserve Hulikere. But for whatever reasons, it is great and a must see place. I wants more pictures like this. can you update more?? The pond looks beautiful and graceful. How glorious it must have been during its prime time, I wonder.